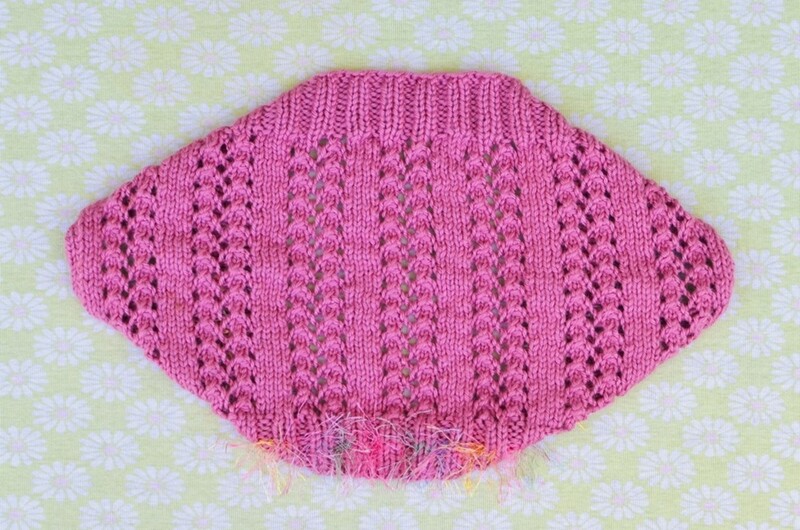 Are you looking for a baby knitting pattern you can make quickly and layer over any top? 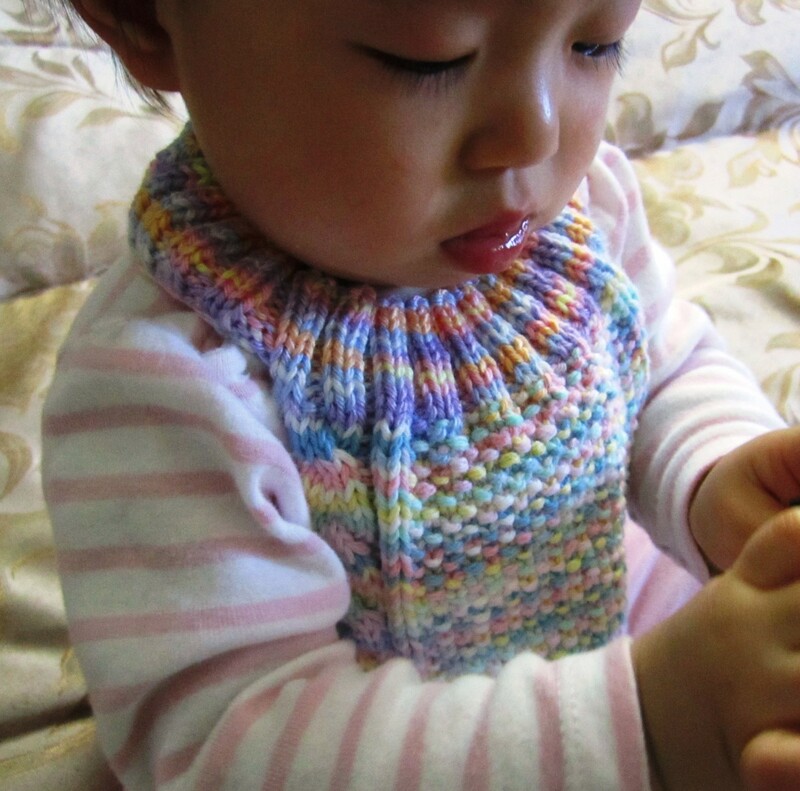 This "Diamonds Rib Lace Baby Shrug" is a great last minute gift idea! 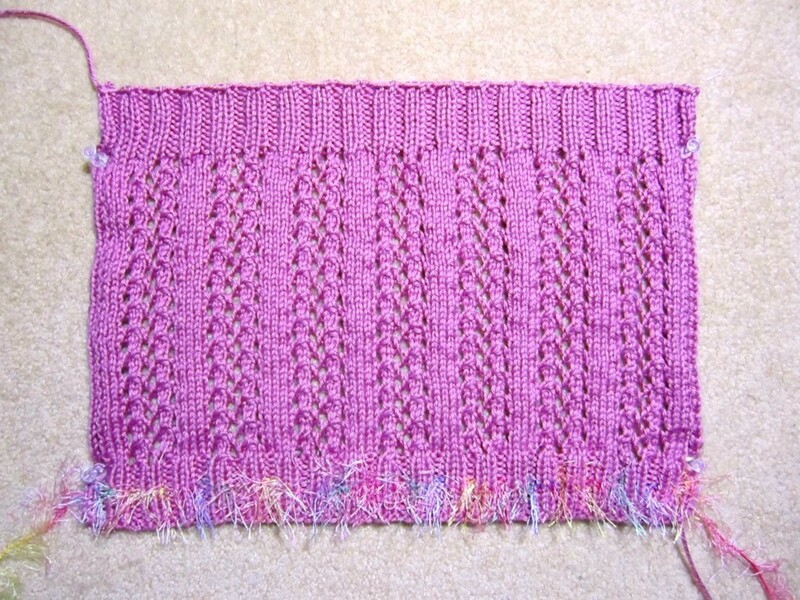 It's very easy to knit because you just have to create a rectangle. 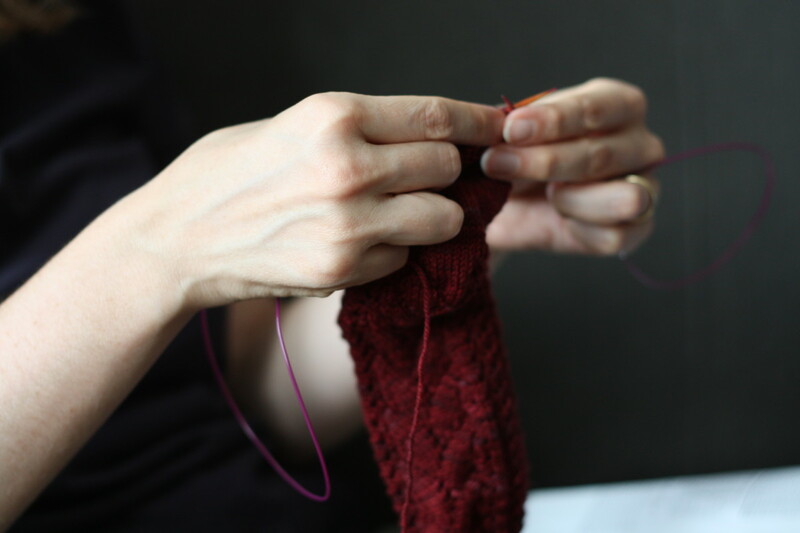 There's no need to knit the sleeves, and there are no pick-up stitches involved. You have to sew just one inch at each end. 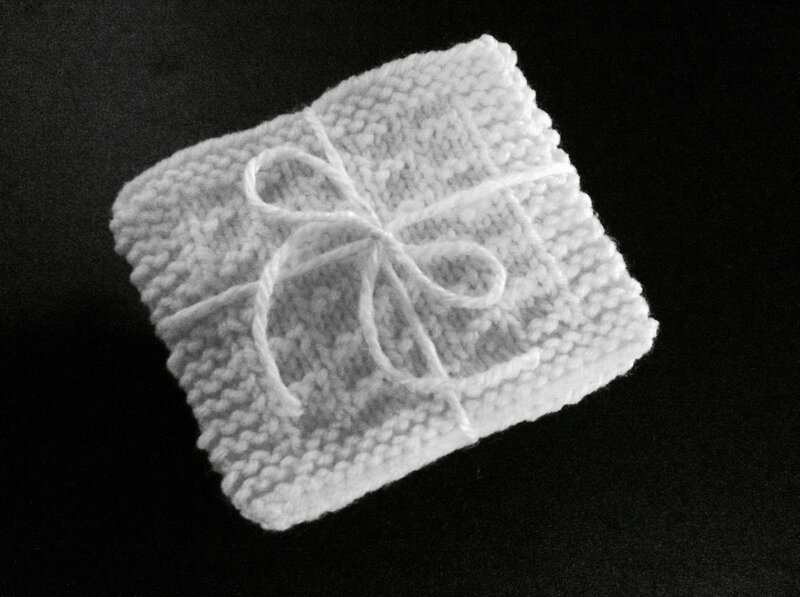 It's also good lace-knitting practice for beginners. 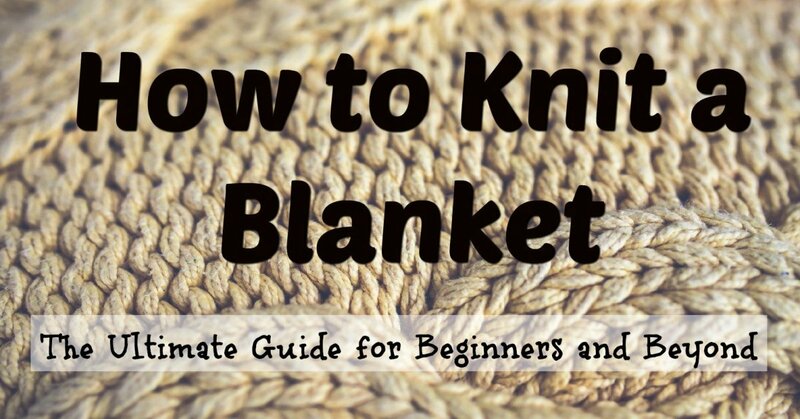 I've also added a video tutorial for you to follow along. Have fun! 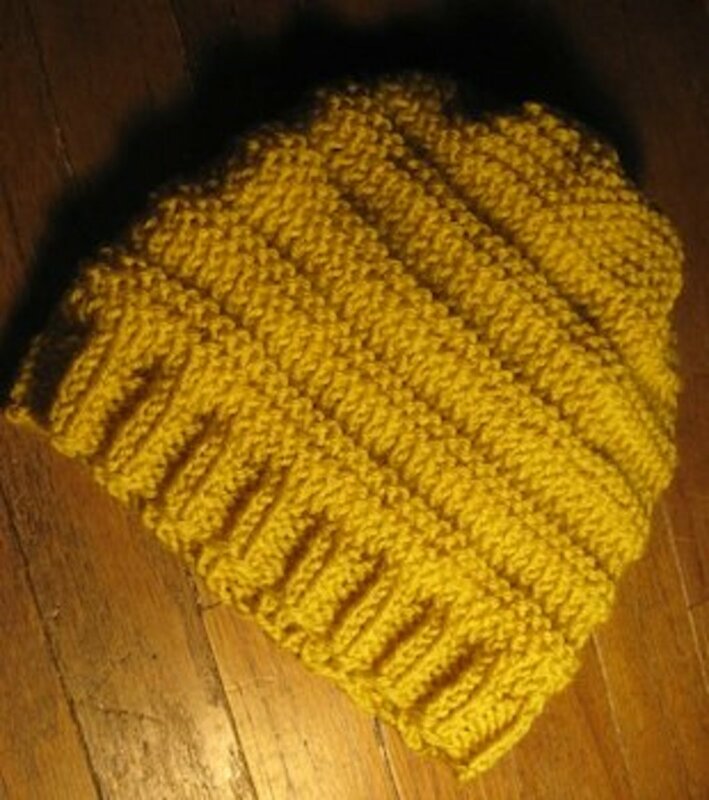 The pattern is for 6-18 month-old babies. 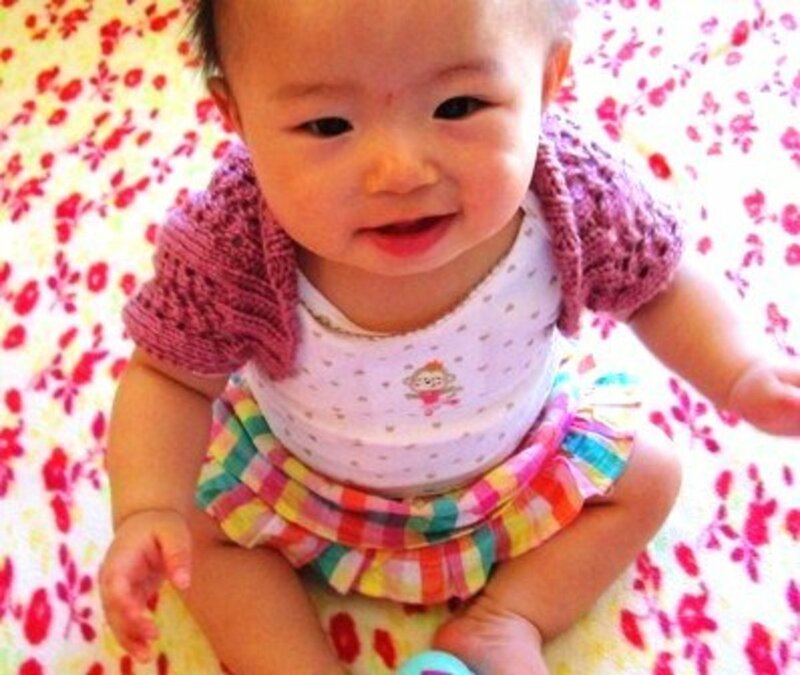 The shrug in the pictures is knitted with category 4 medium worsted weight, Caron Simply Soft yarn. 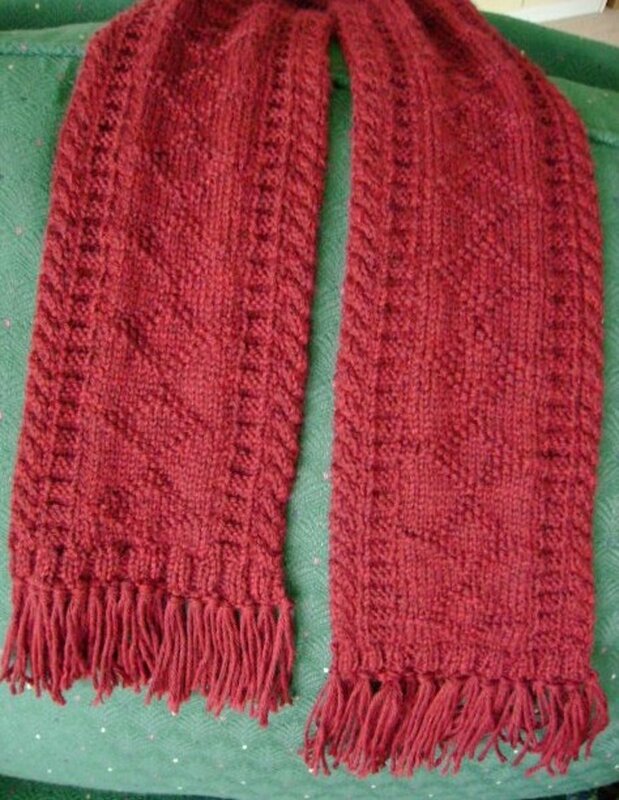 You will need a pair of US 5 knitting needles and a yarn needle. Row 1: (Right Side) K2, *(P2, K2), repeat* to end. Row 2: (Wrong Side) P2, *(K2, P2), repeat* to end. Repeat Rows 1 and 2 (4) more times to reach Row 10. 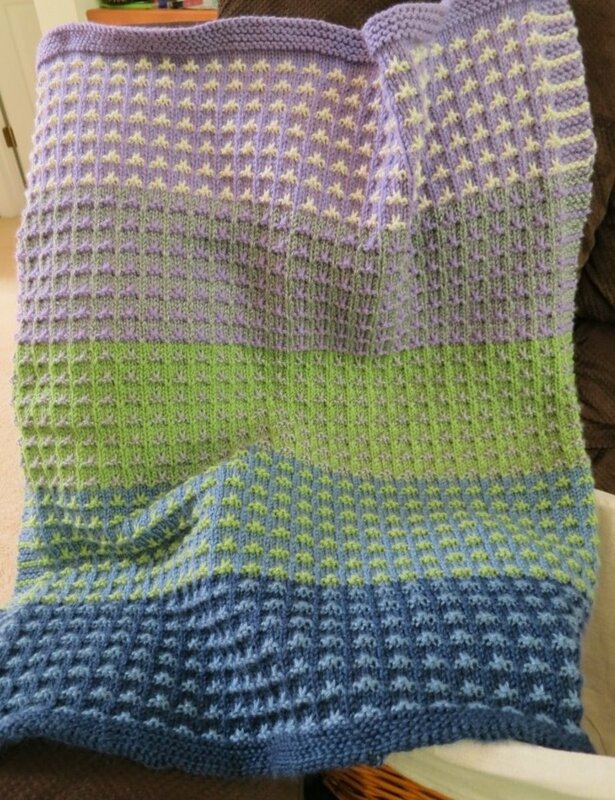 (Option) For Row 5, combine and work together with Lion brand Fun Far yarn. Row 11: K2, YO, K2tog, K5, YO, SSKPO, YO, *(K7, YO, SSKPO, YO), repeat* 6 times to the last 6 sts., end with K2, SSK, YO, K2. Row 12: P to end. Row 13: K2, YO, K2tog, K2, YO, SSKPO, YO, *(K7, YO, SSKPO, YO), repeat* to the last 9 sts., end with K5, SSK, YO, K2. Row 14: P to end. Repeat Rows 1 and 2 (5) times again. 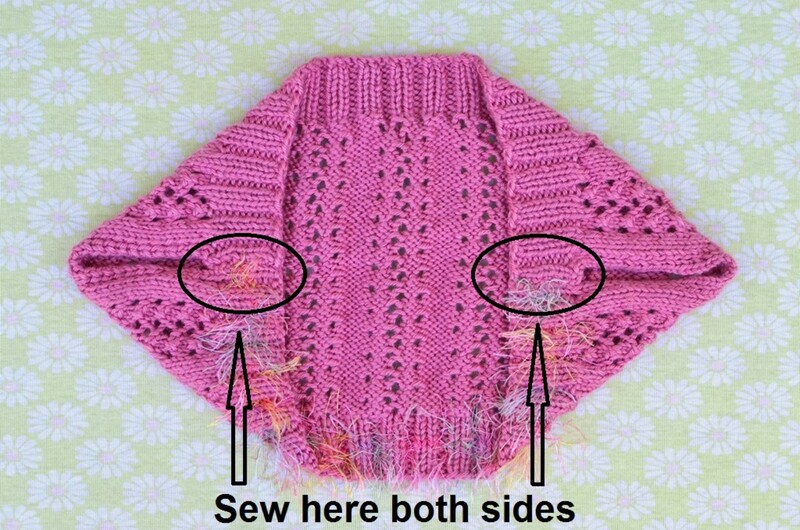 Fold the piece half as shown in the picture. Sew about 1 inch each both side. Enjoy! 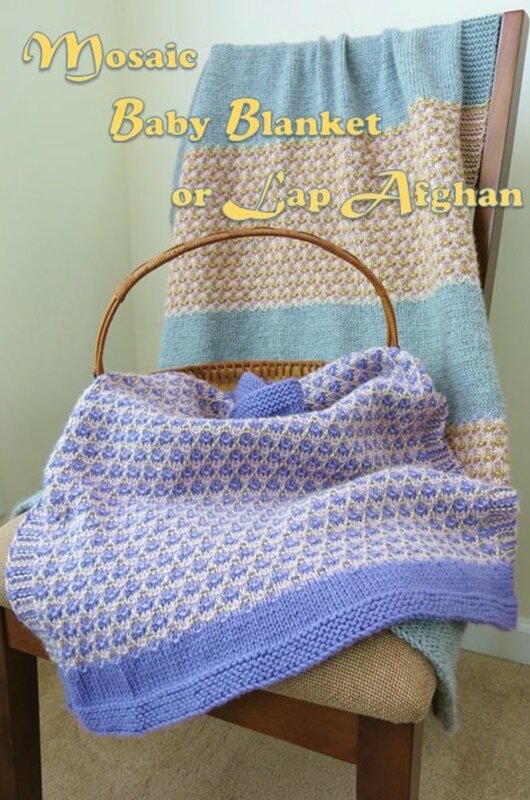 Which one do you prefer to knit most?